grandma's cookie jar: Engage Your Grandchildren in Showing Love - Give Bunnies! Engage Your Grandchildren in Showing Love - Give Bunnies! Today is February 1st - the first day in the month of the year when we think about "love". It is the perfect month to involve our grandchildren in a project to show their love for others . . . by raising money to give bunnies to families in need around the world! Bunnies, you ask? Yes! Bunnies! For just $20 you can give a pair of bunnies to a family in need. This pair of bunnies very quickly becomes more bunnies . . . and can not only be used to provide much needed nutrition, but can be sold and traded for things families need as well. And since a pair of bunnies is only $20 through WorldHelp, it makes bunnies a very affordable project . . . grandchildren can work to see how many pairs of bunnies they can earn! And, it is so easy to make this a fun project! Consider the following . . .
Make paper hearts with two bunnies in the middle and post around your house for each pair of bunnies your grandchildren earn. It will be fun to see how many hearts/bunnies children can post during the month of February and give them a way to see how they are doing! Make Bunny magnets which children can sell to raise money for bunnies. Make Bunny cookies which children can sell to raise money for bunnies (sugar cookies cut into bunny shapes). Make Bunny cakes which children can sell to raise money for bunnies - either cut a round cake in half and place the sides together to make a bunny, or use one round cake and cut the other to make ears and a bow and decorate. 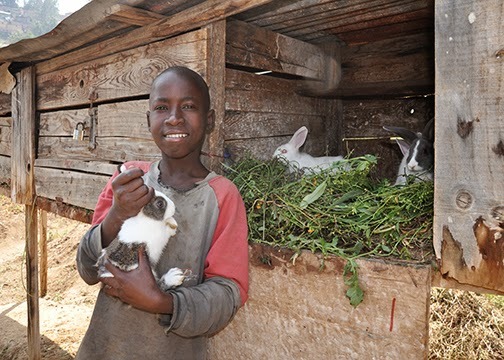 Make pictures of Bunnies which children can sell to raise money for bunnies! So . . . what might you do to help your grandchildren show love to families in need around the world during the month of February?